Microsoft Corp., engrossed in multi-million dollar marketing blitz to counter comical ads from rival Apple, Inc., is now using a portion of its budget to fuel guerilla retail tactics near the Mac maker's stores. 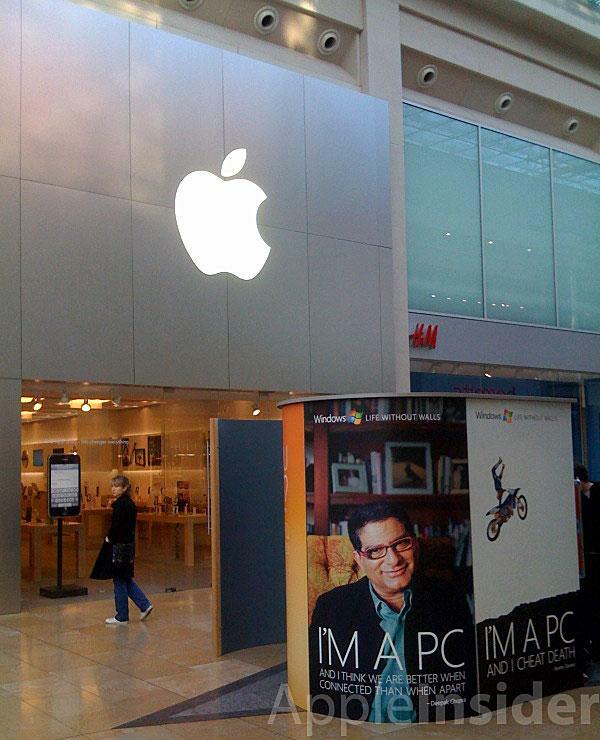 AppleInsider reader Tom submits the following photo, which shows a large Microsoft-branded kiosk parked outside a shopping center-based Apple retail store. "It's a friggin booth where you can record your own I'm a PC video," he said. "This is outside the Apple Store, Bullring, Birmingham, England." He added that a trio of Microsoft staffers will be on hand to turn patrons off from the Mac for the next three days. The move is an extension of the Redmond-based software giant's $300 million advertising campaign aimed at cleaning up the image of its Windows Vista operating system, which has been tarnished at the hands of Apple's long-running "I'm a Mac, I'm a PC" ads. Last month, Microsoft tapped advertising firm Crispin Porter & Bogusky to use Apple's assault as a foundation for a direct counter-strike with its own series of "I'm a PC" ads, which open with a John Hodgman lookalike character who declares that he's been "made into a stereotype." As part of the campaign, Microsoft invited visitors to its website to upload videos and photos that demonstrate "how they, too, are PCs." The company has since select a handful of those clips for inclusion in television commercials that can be seen airing on network television this week. Microsoft now appears to be taking its initiative to the streets. The "I'm a PC" ads are actually a second phase of the company's rebuttal efforts. An initial series of ads was dominated by a pair of offbeat teaser skits (1, 2) featuring Bill Gates and comedian Jerry Seinfeld. Those efforts were postponed indefinitely amid mixed reviews. Ironically, market research data cited by AppleInsider earlier this week revealed that the first series of deliberately eccentric ads dwarfed both Apple's and the new "I'm a PC" ads in viral views, suggesting Microsoft may have been better off sticking with Gates and Seinfeld.